Thanks so much for submitting a report. It has been emailed to the Rum Captain and will be actioned shortly. 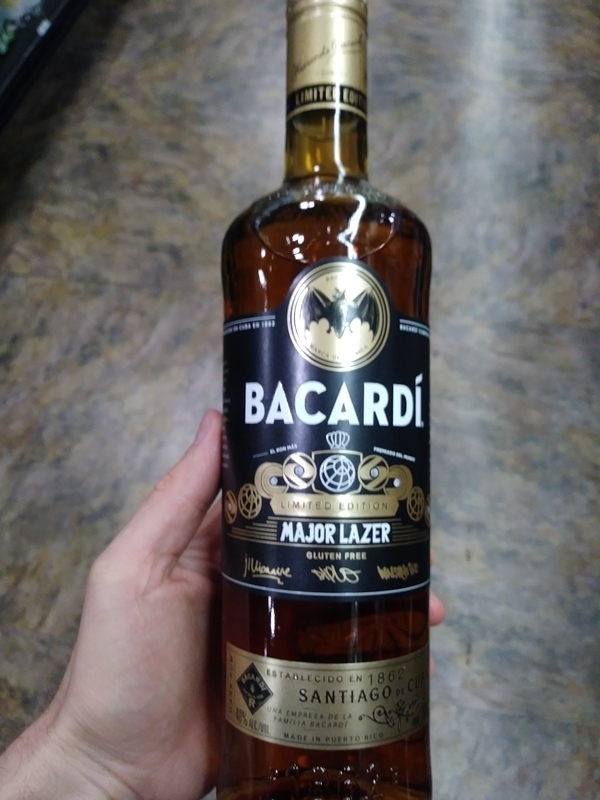 Have you found an online vendor selling Bacardi Major Lazer Limited Edition? Thank-you for your submission. It will appear on the site once verified. Have an opinion about this rum? Signup to rate this rum! Enjoyed a bottle of Major Lazer edition Bacardi with my friend while road tripping through 18 states and 5,000 miles. Standard Bacardi bottle and label design with a tiny mention of Major Lazer special edition. Golden color. Typical Bacardi flavors with added caramel and vanilla straight to the nose and palate. Very strong burn at the end. Nothing special when mixed. My wife brought this home, we hadn't heard of it. It looks like a marketing thing with Bacardi and a hip hop DJ (Major Lazer). I poured it neat and it has a strong, but fruity nose with hints of banana and apricot. It has a rich, but oily, texture with a golden brown color. It warms a little as it goes down, with a little sweetness left behind. Not a bad sipper for the price, and would mix well. We picked this up for less than $20, and I would put it next to a number of sweeter mid-range rums (like a Zaya). Nothing spectacular with this rum. Fine as a mixer! I bought this due to its being a limited edition to add to my collection. Little complexity and subdued flavor lends it to being a staple mixer as is the case with many of Bacardi’s other offerings. This selection caught my eye first because of the price - $10 for a 750ml bottle. How could I go wrong? It wasn’t in the database, so this my chance to give the first rating! This limited edition dark rum from our friends at Bacardi is a solid offering. Even though it’s only 40% ABV, it tastes stronger. It’s got an initial bite that warms as you swallow. A little caramel, a little vanilla, with a pleasant finish. It doesn’t over power your taste buds, so I have to believe everyone will like it. There is not a lot there, but also nothing to detract. Great for mixing and for guests. At this price I will pick up a few more bottles.